Everyone says FUT 19 is pay-to-win, but you're often better off not spending any money at all. One of the most dispiriting gaming experiences you can have in FIFA 19 is to rip $20 worth of packs and get basically nothing. That was me last night as I tried to give my progression a kick forward, only to come away empty-handed. The best I got was Roma striker Edin Dzeko—a powerful but slow target man who costs all of 3500 coins on the open market. He's great in the real world, but nothing special in FIFA. That to me highlighted one of the counter-intuitive truths about FIFA: everyone says FUT is "pay-to-win," but sometimes it's actually better not to spend money. That's because ripping packs is actually one of the least efficient ways to get an elite player. Dropping $20 on FIFA points is exponentially more likely to bring you the sadness of Edin Dzeko than the joy of packing Neymar. EA has designed it to be this way. Mega Packs, Jumbo Packs, and Gold Premium Packs may seem exciting, but they're usually a sham. Most are loaded with extraneous items: kits, stadiums, fitness items, and other detritus designed to get you to use the auction house as much as possible. If you're promised multiple rare items in one pack, you're more likely to get a rare item for fixing injuries than a rare player. To have a chance against FIFA's often miserable pack odds, you frequently have to go big. A friend of mine annually kicks off his year with FIFA by investing a couple hundred dollars in FIFA. Your odds of getting a high-quality player goes up as the year wears on and more special cards are released, but in the early going especially, you're unlikely to be rewarded for spending money unless you're willing to drop a large chunk of cash (or you're just really lucky). With all that said, it's still possible to enjoy FIFA Ultimate Team without spending money. I'd even recommend it. Here are some tips. With some 30 leagues represented, FIFA 19 has a truly gigantic player pool. This has its advantages and its drawbacks. The sheer number of players makes it that much harder to luck into someone like Mbappe, but it also carries with it the joy of discovering a hidden gem from an obscure team in Saudi Arabia or Argentina. While it's true that Messi or Gabriel Jesus are going to be tough to stop no matter what you do, you can still go far if you put together an effective lineup of silver players and play to their strengths. My same friend who annually spends hundreds of dollars on FIFA also delights in building silver teams and watching as opponents quit at the loading screen, convinced that they've run into an expert. Running circles around a loaded team with Jhon Cordoba and his 80 pace is one of the great pleasures of FUT. One thing no one tells you about FUT, MUT, and other Ultimate Teams is that they're secretly investment sims. Sure, you can dump a whole bunch of money into packs and circumvent the market. But with a little bit of research, you can pretty quickly turn a few thousand coins into a few hundred thousand coins. The trick is in accurately predicting the market. In FIFA, marquee real-ife matchups will typically have accompanying Squad Building Challenges, which are built around submitting squads of players and earning rewards. In such events, demand for certain players naturally goes up. So if you carefully track the calendar and note when big matchups will be taking place, you can buy up a ton of players from one team and subsequently make a killing. If you're not keen on keeping a spreadsheet, there are other tools at your disposal. Futbin, for instance, will automatically track your collection and let you know which players are most likely to yield a substantial profit. When holiday events like Ultimate Scream come around, you can do well simply by buying up themed cards early, then dumping them a day or two before the event is set to begin. Absent that, simply knowing when other players are ripping packs and investing accordingly is a good way to earn coins. Saturday morning around 11am PT is usually a good time to invest, for instance, as its one of the most active periods for both Americans and Europeans. Playing the market may sound daunting, but it's actually pretty easy if you think of it as accruing small profits over a long period of time rather than getting instant payouts. Given enough time and patience, you will find yourself in the position to buy even elite players. Believe it or not, FUT is actually pretty generous with its rewards. Just by playing a handful of games in Squad Battles, for instance, you can earn several packs of players and as many as 10,000 coins. And Squad Battles renew on a weekly basis. Similarly, completing some of the early SBCs at the cost of a couple thousand coins will earn you solid rewards and good players. The same goes for the new Division Rivals system, which places you in a bracket with similarly-skilled players and doles out rewards every week. If you're good enough to get into Weekend League and succeed, you can get still more prizes. The only modes that aren't really worth investing in are Single Player Seasons, a vestigial remnant of older versions of FUT, and the FUT Draft, which requires you to do fairly well in order to get a reasonable return on your coin investment. Play enough and you will rapidly amass a pretty sizable pile of coins. You may even luck into an elite player in one of the packs you earn, earning you still more coins that you can turn into new investment opportunities. Sooner rather than later you're going to find teams full of these guys. But what about card creep? One of my persistent problems with Ultimate Team over the long term is card creep. 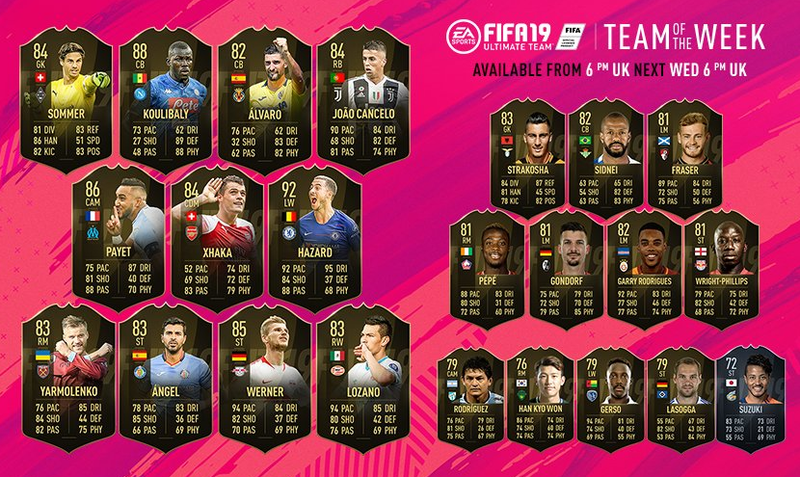 Basically, the longer a particularly iteration of FUT lasts, the more In-Forms, seasonal variants, and Team of the Week cards will clog up the market. This has the positive effect of depressing the value of previously expensive cards, making it that much easier to have a competent team from the start. But after a certain period of time, it will become extremely difficult to avoid teams loaded with ridiculously overpowered superstars. I go back and forth on this problem. On the one hand, I think there's a certain point where the degree of difference isn't actually that high between, say, an In-Form Messi and a Team of the Season Messi. One way or another, you're going to end up with an extremely strong card. On the other, the sheer availability of super cards and the surplus of whales tends to make opposing teams depressingly similar to one another. It becomes much harder to roll out a fun silver team when they're starting opposite Mohamed Salah and Kevin De Bruyne. That's why I tend to drop out of FUT early: the rise in homogenous super teams eventually gets oppressive. Right now we're in a nice little sweet spot in terms of what FUT has to offer. By completing objectives, playing Squad Battles, and knocking out some SBCs, you can rapidly accrue a solid team and have a lot of fun playing a variety of teams. And FUT actually can be fun! I like the degree of control it gives me over my team. I like obsessing over my team's badge and kit for the season. I like that it has an "Established November 2013" marker, offering a sense of community. Talking with Tom about FUT his morning, he told me that he's chiefly haunted by the feeling that he could build his team that much faster if he was willing to spend money. But having dropped a useless $20 on packs, I'm not sure that's necessarily the case. Short of going full whale—which plenty of people do—it may actually be better to not spend any money at all and to simply let the game take its natural course. After all, sometimes it's much more fun to have Jhon Cordoba leading your team than Messi. Tagged with Analyses,	Electronic Arts,	PC,	PlayStation 4,	Xbox One. One of the most hated (or loved) Sonic games ever is getting a new lease on life.